When Monday Night Football rolled around, one of my friends suggested coming to this wrigleyville bar for the Bears game. It happened to be a Pittsburgh Steeler bar, so I felt right at home. Anyway, the bar has an amazing heated beer garden open year round. They had a decent beer selection and surprisingly had even drink specials. But it was the food special that sold me. Either a burger or BBQ pork sandwich with a side for only $3.00. Unfortunately, we had some awful service with out waitress bringing us wrong beers, bringing us more beer without us requesting, spilling food, and not being attentive for most of the game. I swear we had to call the bus boy to get out waitress every time we needed something. The food itself was nothing spectacular... Well I guess the price is great... But that's all. And for those reasons, I thought 2.5 mile rating was fair. There was one menu item on special that was the clear front runner for my meal. 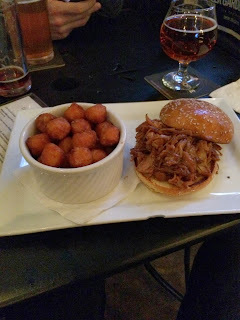 The BBQ pulled pork sandwich for only $3.00 and came with your choice of french fries or tater tots, which I chose the latter. The sandwich was not the largest, but what can you expect for such a cheap meal. The meat was tender and covered in a tangy BBQ sauce. The bread was nothing special--unless you truly love enriched flour hamburger buns. I was extremely disappointed to have sweet potato tater tots arrive as my side. The lady never stated sweet potato and I was craving just regular tots. Maybe a small scoop of cole slaw would be nice to give a contrasting texture to the sandwich... but I wouldn't want to pay any more than those three bucks if I were to order this special again. - Watching Monday Night Football here is great. The heated beer garden wasn't packed, even for the Bears game. - Plenty of food and beer specials. - If you want the rowdy crowd for football games, this place is not for you. - Don't expect the best service here.